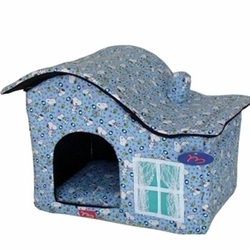 The most adorable little house for dogs - the Snoopy Dog House! Yes, this little house has a chimney, one curtained window and a wide, welcoming door. Did we say that the fabric print is the likeness of Snoopy himself? Great Bonus! Fully insulated to keep your dog warm in winter and cool in summer, this dog house provides that much needed space for your puppy can relax, nap and contemplate on the affairs of his dog world.